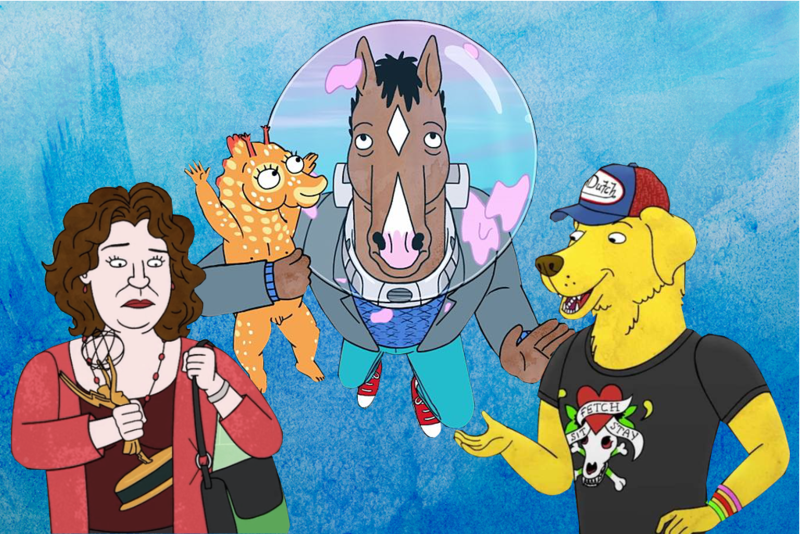 Inside The World Of BoJack Horseman Raphael Bob-Waksberg gives us the inside story of one of the most ingenious shows on TV. 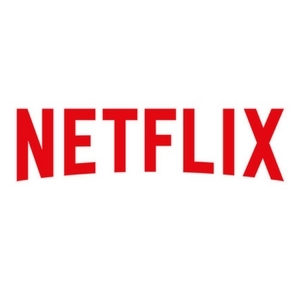 Netflix is the world’s leading internet television network, offering original series, documentaries and feature films. Watch anytime, anywhere, on any screen. It’s actually kind of tough trying to craft the right interview questions for Raphael Bob-Waksberg, the man behind TV’s weirdest adult animation series, BoJack Horseman. 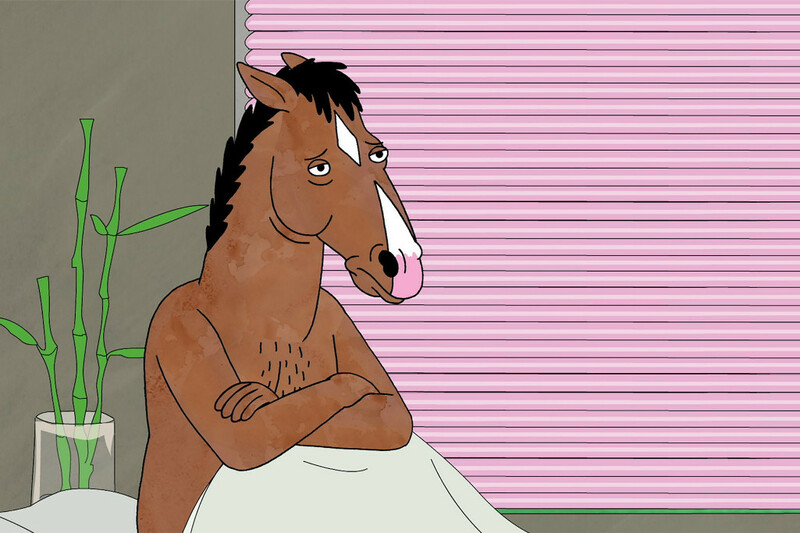 The cartoon, which is about to begin its fourth season on Netflix, follows the bizarre misfortunes of BoJack Horseman, an anthropomorphic horse (voiced by Arrested Development‘s Will Arnett), who is the washed-up star of a corny 1990s sitcom, trying to reclaim his former acting glory. Surreal and sometimes more than a little depressing, the series is also littered with brilliant visual puns and intricate pop culture references. 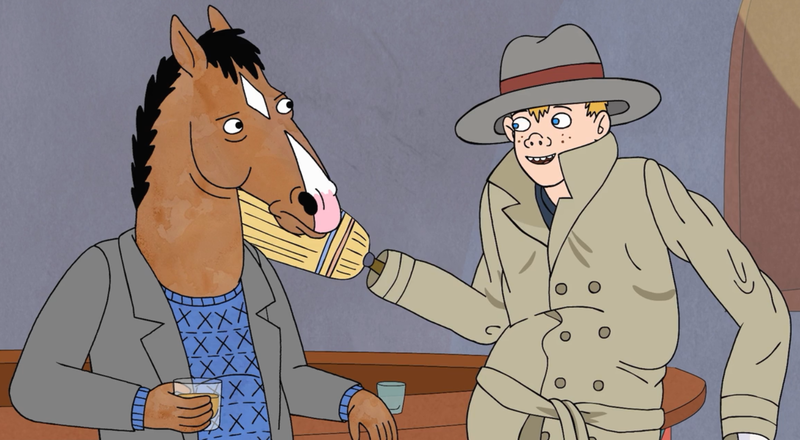 True to the show’s no-holds-barred aesthetic, Bob-Waksberg himself is game to answer any questions you have about his horse anti-hero and the ingenious world of Bojack’s Hollywoo. Bob-Waksberg laughs, but I’m totally serious. 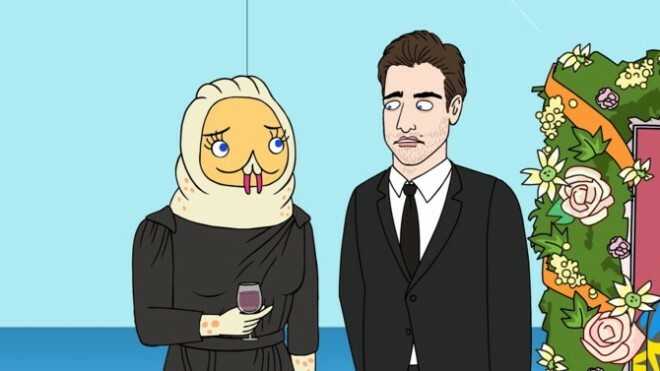 This has been niggling at me ever since the show introduced the two Gyllenhaals, at a Hollywood elite’s wake, as “Jake and Maggot Gyllenhaal” back in season two. “Are you asking for an in-universe explanation or a meta-universe explanation?” Bob-Waksberg asks. 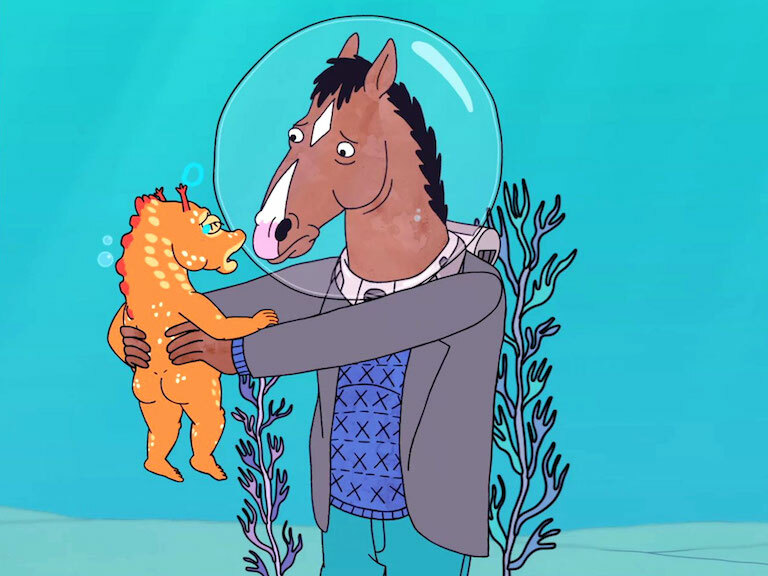 A fair question, as BoJack Horseman takes place in a parallel Hollywood called ‘Hollywoo’ (since someone stole the ‘D’ from the Hollywood sign) in which humans and animals live, work and love together. 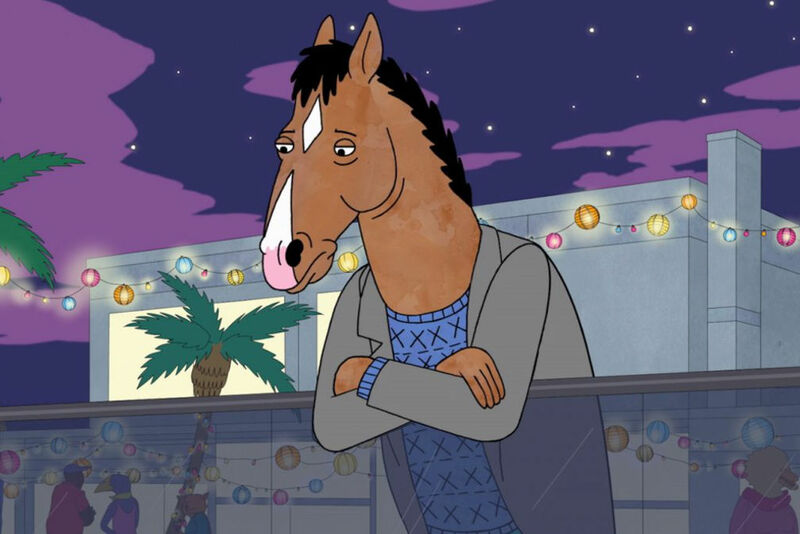 And BoJack, the show’s horse-man protagonist, has had daliances with humans, cats, owls and (disturbingly) a teenage deer. “An in-universe explanation,” I reply, and I can hear the glee in Bob-Waksberg’s voice as he launches into it. Junkee: How did you originally come up with this concept of BoJack? I mean, forgive me if this is a bit blunt, but is it just a smarter way to write a story about a sad white guy? Raphael Bob-Waksberg: [Laughs] Yeah, I guess so. Originally it came because I wanted to do something with my friend Lisa Hanawalt who is this amazingly talented artist. She was drawing these animal people on her own. So I looked at a bunch of her art and I thought, what would I want to do with these characters? I guess what I wanted to with them was explore a story about a depressed actor who lives up in the Hollywood Hills, isolated from everybody and whines about it all the time. What makes you decide, in this anthropomorphic world you’ve made, which characters are humans and which are animals? We kind of play it by feel a little bit. In general we don’t want to have too many of one or the other. We want to keep things a little bit equal. It’s hard because the animals are always more fun to design for Lisa and for us, the writers. We try to design that as best we can so if we have more than three or four people in a room together, they’re never all animals or all humans. Sebastian St. Clair, when we first wrote him in, was just described as a wealthy philanthropist. And then Lisa, in the design of it, decided to make him a… I don’t even know, was he a leopard? I guess. Some kind of jungle cat. And then Keegan-Michael Key came in and said, “You know, I thought I would do this accent for him.” We said, “All right, I guess he sounds like that.” We kind of figure it out as we go. 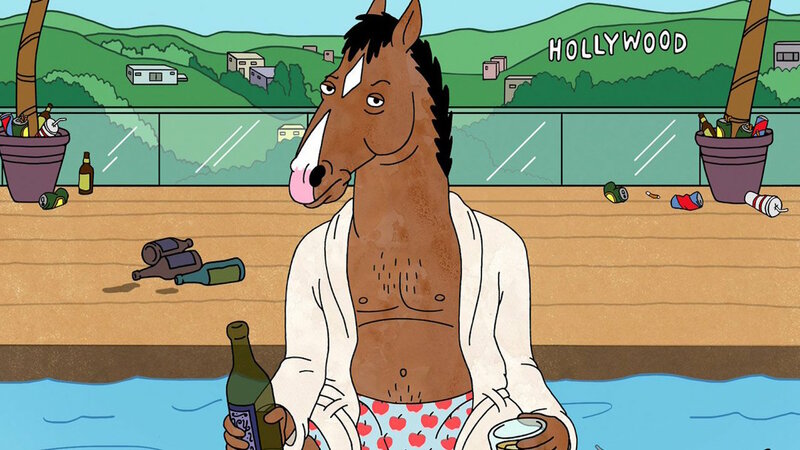 BoJack is part of this ever-growing catalogue of shows and films about Hollywood. What do you think is the fascination with the industry? There’s actually a hesitation, I think for people in Hollywood — especially amongst the executives — when you pitch them a show about Hollywood. They feel like, ‘Oh no, no one cares about that. No one’s really interested in that. Enough already’. And yet projects keep getting made. For my show specifically it really felt like it was about this character getting everything he always wanted and he still couldn’t be happy. You know? He had every opportunity for success, but he still wasn’t satisfied. I really wanted to do the extreme version of that as I think it’s somewhat, sadly, a universal feeling that everyone has felt, in their own field, or in their own life. They’re like, ‘Well, I thought I would get this promotion or I would start this family’, whatever it is, ‘I thought that that would be the thing that would make me feel whole or complete, and it doesn’t’. I felt like Hollywood was a very external realisation of that. I wanted this famous television star that is recognised everywhere he goes and lives in this house on top of the city, overlooking it all. Like Mufasa and Simba looking out over the lands of their dominion. Everything the light touches is yours. It felt like a very big way to express this universal idea — and a lot of Hollywood stories are kind of that. Even though it is very navel-gazing and self-obsessed. In some ways there’s a lot of heart to the show, but in other ways it does feel pretty hopeless. What do you feel is the underlying ethos of your story? I guess it evolves and changes over time. I think sometimes we’re in a very cynical mood when we’re making a show. And other times we think, ‘Well, you know, is it hopeless? There’s a little bit of good stuff out there’. I think the underlying ethos is that existing is hard. I think we’ve been lied to by fiction in the past. Like, narrative in general — I think it’s conditioned us to believe that if we are good we will be rewarded, and if we have good intentions, that will lead to good actions. And if we are true and brave and loyal and kind, then things will work out. I’m interested in the ramifications of believing in that. And I think that’s another reason why Hollywood is interesting, certainly for me because the show is about how the people who create these stories are the people who are affected by these stories. Actually, both those things are true simultaneously. I think that’s really interesting. TV, and comedy especially, has really delved into mental illness recently. What do you think makes that such a prescient topic right now? It’s funny because it definitely does feel like that’s a thing that’s happening on TV and that we are a part of it. But it was never our intention to really delve into exploring mental illness or different versions of depression or anything like that. I think we’re just seeing more and more are shows that are allowed to take their characters seriously. I think that’s something BoJack is and I think the fact that you’re seeing more and more shows that are serialised goes hand in hand with that. In the past, a character had a funny quirk, but you couldn’t really delve into that because you had to make every episode make sense on its own. You couldn’t go too dark with it; you had to keep that status quo going for as long as possible. But now you’re seeing the creators of the show really take those quirks seriously, and the actors can take that seriously and go, ‘Okay, well what does that mean that this character acts this way? Or react to these situations in this manner? Why would his character do that?’ You can keep asking questions and following up on that. These characterisations get richer and deeper and more deeply felt. If you look at the last 60 years of television, I think you’d actually see a lot of characters that exhibit the symptoms, perhaps, of the kind of thing you see now. The only difference is now you can really unpack that and we’re given the space and the interest to really explore those things and take them seriously — and take the characters seriously. 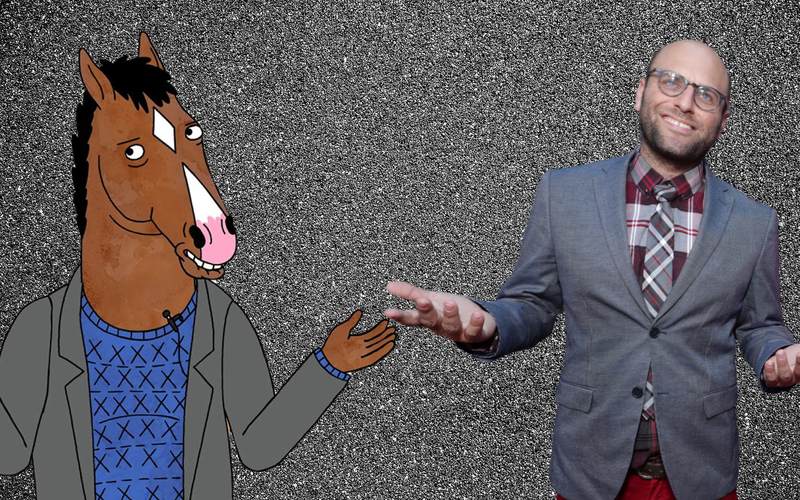 And how far do you think you can go with BoJack? Because he’s done some pretty messed up things over the past three seasons. Yeah, I think we’re still finding that out. Every season has been a surprise. It’s like, ‘Okay we’ve gone about as far as we can go’. But then, once you get the idea for how to take it farther and farther, it’s hard to shut off the part of your brain that goes, ‘No, I really want to see that’. Like I said, I really am into following through on things that have happened and building on them. And sometimes that will mean going darker and sometimes that will mean the opposite. And you might be surprised by a moment of grace or redemption. I think we’re still figuring that out as we go. Hopefully we’ll be on the air for many more seasons and we’ll get to discover all sorts of different edges and contours of the character. Do you ever want the show to be overtly political? Or do you try and steer away from these topical identity and politics issues? I think it is overtly political. I think everything is. I think it’s a mistake to say, ‘I am not a political person’ or ‘This is not a political statement’. Because anything you do — taking up space in our country or in the world — is political. I think claiming to be impartial and doing nothing is a vote in confidence for the status quo. I think even if you claim to not be political, you are in fact being political. I think it’s dangerous to try to shy away from those conversations; I certainly don’t intend to. I think it’s difficult to be topical on our show, because it takes a while to put it together and then all the episodes come out at once. It feels like we’re a bit behind the real world. We try to discuss more evergreen issues that we feel will have some relevance, no matter what the particular news story of the day is. And fortunately, or unfortunately, there are a lot of very serious issues in our country and in our world that don’t seem to be changing anytime soon. We make some pretty relevant commentary on some real blights to society, and then six months later the episode comes out, and guess what? That problem still exists. I would love to wake up in a world where my show is no longer relevant because everything is better, but unfortunately I don’t see that happening anytime soon. I wanted to ask you about race, because I think that one of the things about this anthropomorphic world is that it does get more complicated by race as well. How do you address that on the show? That’s a good question. I would say we mostly don’t. Honestly, people can draw their own conclusions about that. One thing we really didn’t want to do was to make animals an analogue for race in some way. Early on I didn’t want to do a thing where I’m saying, ‘There you go, people of colour are animals’. Right? Like, ‘These dirty lemurs represent immigrants’. Or something. So I really tried to keep that separate. But then it gets complicated because once you have all these talking animals, the racial dynamics of the roles kind of do change a little bit. Like, what is the difference between a white person’s experience and a black person’s experience, when you also factor in a cow person’s experience? I think there are still differences in our world and I think we’ve hinted at some of them in the show sometimes. But I think our commentary on race is not as sharp as some of the commentary in other areas, and I would attribute that to my own discomfort talking about it and also the frameworks and the rules of the world that we’ve created. You can catch Raphael Bob-Waksberg in conversation with Marc Fennell at Video Junkee 2017. View the event and book your tickets here.